Welcome to Day 2 of "The Daily Marker 30 Day Coloring Challenge" Blog Hop. Kathy Racoosin from The Daily Marker wants to share her love of coloring with you. Today Kathy has assembled a blog hop to give your creativity a jump start with some of her favorite stamp companies & Online Card Class partners. To start at the beginning of the hop go to The Daily Marker. If you are coming from the blog of Lawn Fawn you are in the right place. Kathy has the full list if you encounter a broken link. Here is a card specially put together for this fabulous Coloring Challenge and it has quite some meaning behind it! Ever since we started Mama Elephant, we have learned so much and met so many wonderful people in this industry. We soon began to realize that we don't just make and sell physical stamps and tools. We would like to believe that we also produce something that can help achieve an experience that we can share among friends and create something that can help lift a smile. So we are extra proud to be part of this 30 Day Coloring Challenge Community and super proud of Kathy Racoosin for starting it! I made this card to commemorate the time we crafted with some incredible stamp company owners, all in one big room. The sentiments I used in this card are from Hero Arts and the Ranunculus images are from Simon Says Stamp along with our Girlfriend Stamp Set. Now its time to get with your friends and color, color, color! GIVEAWAYS: During the hop you will find lots of giveaways along the way. Comment below and Mama Elephant will select a winner for a $25 Gift Card to the mamaelephant.com shop! The full list of ALL winners from the individual blogs will be announced on The Daily Marker Sunday March 12th. Kathy from The Daily Marker is the creator of “The Daily Marker 30 Day Coloring Challenge”. The Challenge is a great way to gain confidence with your coloring and join in a community of positivity and coloring enthusiasts. The challenge is also a great way to get full use of your stamps and coloring mediums. THE GOAL IS: To color something daily even if it's a few minutes but, certainly not required. It’s been proven that coloring can lower your blood pressure & make you feel happy and relaxed so it’s worth carving out a little time for yourself each day. You will find that Kathy encourages you along the way to stretch your creativity a little bit more and to feel successful with your coloring. The next stop on the hop is Concord & 9th! Excited about the challenge! I only got 15 minutes in yesterday but maybe today I will get to do more! What a great card celebrating girlfriends! I've met so many nice people since I started making cards and joined Instagram in the fall. Such a supportive group! That's such a cute card! I love seeing all of the different coloring methods in this hop. The 30 day Challenge gives me the focus I need to sit down and have color time therapy 🙄 and I'm better for it ! I'm picking up some great tips on this hop. Thanks! Yeah Girlfriends is right! Fabulous card and thank you for the video! Adorable challege and sponsors. Thank you Mama Elephant! Thanks for the Beautiful card too! So cute, love the friends stamp. Love mama elephant and would love to win!! What a cute card! Perfect coloring on the girlfriends and the background! Your card is so beautifully colored and is absolutely adorable!!! This is very sweet! Pretty border too. Such a cute and colorful card! This card is really cute! What a fun and happy card! Love the bright colors and of course the fabulous coloring! Wow what a great idea... I love to color!! I love how the blue background makes the rest of the card pop. WOW! Awesome card, I love the bright colors! such a cute cute card!!!!!!!!! All cards are the best! The card is so colorful! Gorgeous!! I love to color so accept the challenge! A happy card on a cold winter day! Yay! I absolutely LOVE your colorful and heartfelt collaboration! So sweet, and so true. Very cute card and I totally agree that whether we are stamp companies or different nationalities, we are better together! Super cute! I love Mama Elephant! Such a cute card, love the meaning behind it. Although I am just a beginner I can see how this community comes together, there have been so many nice and encouraging comments on the cards for the challenge. Love your card but lol, that's the fastest video I've ever seen! What a darling card! I love how you framed up that sweet bunch! 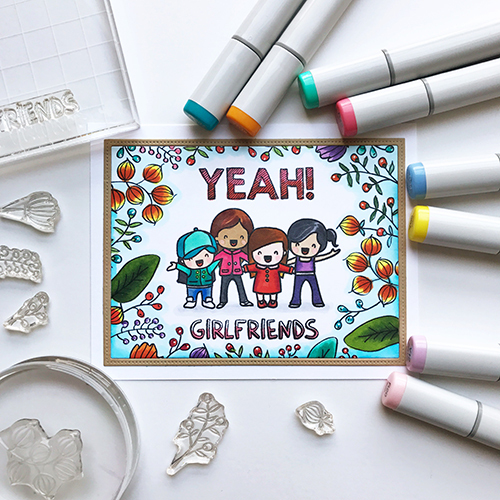 I LOVE this fresh and fun girlfriends card! Beautiful color, and I love how you created those blue edges--so pretty and flawless too! Great card - thanks for partipating! Adorable card! Love the inspiration behind your card. Girlfriends are so much fun! Love Mama Elephant, this card is darling and I think I like to color with my copics the most! Wow this is really a wonderful card and the coloring so fantastic. Thanks for sharing us your inspiration. I like how you combined these stamp sets! Adorable card!! I can color all day its so relaxing. Its a fun adorable card ! Where would we be without girlfriends! Cute card! Love the stamps and this cute card! I learn so much! But have WAYYYY more to learn! Your stamps are so delightful! Love the card! TFS and for a chance to win. Love that card! What an fun inspiration for a young girl. Thanks for the opportunity to win! This card is soo cute and wonderfully colorful!! Love this design! So colorful it makes me smile! Thanks for all you share wih us! Such a cute card and thank you for the video. Love the 30 Day Coloring Challenge; inspires and motivates me to get those color tools out from the drawers. Oh my gosh, this is such a cute card with fabulous coloring! I love that you mixed stamp sets and companies! The stamping community is such a generous place! Very cute card. I'm always looking for coloring inspiration! I've notice a lot of people on pinterest are using the idea to stamp around the card using different stamps to highlight the center main image. I have never done that myself, but will on one of my next cards. Thanks for the inspiration and for the chance to win. Yeah, Girlfriends, Mama Elephant is offering a $25 gift voucher as prize!!!!! - WOW and thanks for the chance/dream to win!!!! Have all my fingers and toes crossed!!!! LOVE your very cute card!!! Wondering if anyone has ever finished a coloring book? Love to color!! Oh my! What a fun scene you've created on this card!!! And I love how you colored it!!! So fabulous! Thanks for the inspiration! I love coloring and your images are so sweet!! Love the community and love the chance to win. Thanks. This is AWESOME! I love those images and how perfect the card is for good friends. The Girlfriends Stamp Set is so adorable. super beautiful card, I lvoe all the color! Really love the coloring on this card. Love your card. The 30 day challenge is fun, I am enjoying coloring but haven't shown anything yet, trying to gain confidence. Aaaacckkkk - HOW CUTE IS THAT? Amazing coloring!! I think those girlfriends are darling! Gorgeous coloring on this awesome card! Love the girlfriends!! Goodness, I just realized I hadn't subscribed to your youtube channel!!! Beautiful card. And I love the spirit of friendship in the crafting industry. It is great to see a combination of stamps from some of my favorite brands. Love your card - most especially because it's really showcasing an inclusiveness that I believe we all should practice more of! Thanks so much! OH my goodness! That card is to die for cute! Love what it represents also! I love how. Right the color is on your card! Beautiful!! What a fun card with so much fabulous color! WOW that was some super fast coloring and it turned out great. Love the little girlfriends. Haven't been to your blog before. Love it and put the link in my favorites. Glad you're participating so I can find new, fun, inspiring creators like me. I am loving this challenge, and learning so much. Thanks. I like the floral boarder around your card. I can't wait to colour in my mama elephant lunar animals! Such a fun card to color! Such a cute card. It would work great for a group of friends! What an adorable card! I YES - it is much more than just a craft industry - it is a community of friends! LOVE that! I love the combination of stamp sets together! They fit together so well! Aww.. such an adorable card! Loved it! Thank you so much for this generous giveaway! What a cute card! Love that stamp set! I love the colors you've used on the card above! The layout is perfect too! Such a sweet card. The stamping all looks great together, and the colouring is fabulous. Thanks for the chance to win! Such a happy and cheery card. Thanks so much for sharing with us! Loving the hop, cute card. I so loved that card. Cute card, Mama Elephant! TFS! And thank you so much for the chance to win! Such a sweet, cute card! Love the stamp and the coloring here! I love the card! My jaw dropped at how amazing it looked when I saw it! oh mama elephant your images are so cute. Love to see all of Kathy Racoosin's coloring tips and now this is so fun to hop along with all of her sponsors!! She is so delightful to follow along with and learn from. Love today's card and your coloring as well!! Love the Girlfriends card! So much collaboration and creativity brings so much inspiration! Thank you! Hello I love this stamp set very cute for us crafty gals. Saw this card on instagram and loved it! Sooo cute! beautiful coloring. I love that you embrace the stamping community! I love the girlfriends this is perfect for m Ladies Night invitations. This card is so fun! What a fun card for a friend! Super cute and fun card! This is such a fun and sweet card with great coloring! Thanks so much for sharing, it's so nice seeing the love these wonderful companies have for each other. Awesome card, the coloring is fabulous! Loving the challenge and this fun hop! Love the bright colors and cute images. I love coloring. I've loved it since I was a very young kid.. great hop and seeing others techniquesay. How have I missed this stamp set?! Must go rectify that right now! Thanks for sharing! Sweet card!! Beautiful vibrant colors!! CUTE card! I have been card making for a bunch of years and now my (almost) 87 year old Mom is making them too. She and her Gal Pals LOVE to color!!! I have always shied away from coloring but seeing all the amazing blogs has inspired me to try my hand at it. I recently purchased a handful of Copics and I am having so much fun learning how to use them. Thank you for the inspiration. Love the mix of products! :) So fun! I love the sentiments. The card-making crowd seem to be such amazing cheer-leaders for each other. It's almost like each one does what they like best and celebrate the fact that other companies do other things. One thing I have learned: no one company is best at everything that appeals to me. It's wonderful to witness such non-competetive cooperation. If I am wrong, please don't tell me! Very sweet card, creating cards for friends is one of my favorite things to do! I'm just in love with the cute Mama Elephant images and they would be so much fun to color! Thank you for sharing. Mama Elephant has the cutest little stamps! Thanks for the chance to win the giveaway! Very cute! I love all this coloring inspiration! Love the brightly colored people, so cute! This is so cute. I love all the inspiration here and you're right it is so much fun to get together with others as we create and color! Love the inspiration on how to use what I have to do amazing things! This image always makes me smile...such a fun card. Loving this blog hop. Thanks for the opportunity to enter this giveaway. just luv that stamp set. great job! Great card, with awesome coloring!! Soooo cute, love your girlfriends! This is such a fun blog hop! Cute card! Adorable card celebrating girlfriends! Thanks for an opportunity to win! I find coloring a great stress relief. Thank you for the chance to win. Such a happy card! Love the coloring! Great hop! Love the card! That's a really cool way to layout the stamps. Lovely colouring too! Such a fun card! I love the bright colors! I love this stamp set, and this card is adorable!! Adding this set to my wishlist! Love the beautiful Copic coloring! Love the combination of elements on the card! So cute! Very nice card ! Thanks for the chance to win. Such a fun and colorful card - I love it! Thanks for being a sponsor on the hop. So much fun seeing everyone's work in one place! Thanks for being a part of it and for sharing your talents with all of us! Such a sweet and colorful card, perfect for this challenge! Very cute card like always.. Love it.